Use our handy search form below to find the new or used auto parts you’ve been looking for. Once you’ve found your auto part, call or email us to make your purchase. We can deliver your part to you by a number of different services or hold it for an in-house pick up. 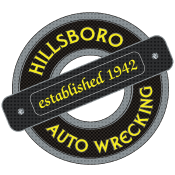 You can also go to our Hillsboro Auto Wrecking eBay Store to see what auto parts we are currently offering there. Or come visit us at our Hillsboro Facility to see what we have on hand. We will help you find the auto parts you need!